A Radically New Government In Pakistan? Pakistan has a new prime minister. A remarkable man: a remarkable history-making career in cricket leading to numerous awards and records; a remarkable politician, mocked when he started, who after a 22-year struggle has reached the pinnacle of power. Bringing home the 1992 World Cup as captain of the Pakistan cricket team made him a national hero. His achievements in the sport have led to him being called one of the best all-rounders in the sport and the finest fast bowler cricket has ever seen. He is one of only eight to have achieved the all-rounder’s triple, meaning over 3000 runs and 300 wickets in Test matches. Still, he will need all the skill and tenacity he has displayed in his dual career to cope with Pakistan’s current political and fiscal problems. Although his PTI (Tehreek-e-Insaf) Justice Party did not secure an absolute majority, it has more seats than the previous two major dynastic parties run by the Sharif and Bhutto families. If he is able to diminish the influence of enormously wealthy landowners and corrupt industrialists and make a significant dent in the feudal society outside of urban areas, that itself would be a signal achievement. He has already made woeful inequality a cornerstone of his platform. Whether his gradual shift over the years towards a more religious discourse (as when addressing the plight of the poor) takes the form of a Taliban-like anti-feminism is difficult to imagine despite the exaggerated fears of certain commentators whose bread and butter is feminism. Were it true, his former wife and mother of his two sons, Jemima Goldsmith, who is a Contributing Editor of the established left-leaning New Statesman, would not be congratulating him publicly. They have cordial relations and mutual respect, and he often stays at her mother’s house when in England. Campaign rhetoric as a guide to subsequent policy is notoriously unreliable. No matter, we will know soon enough. He has noted often that Pakistan has failed militarily with the Taliban, thus leaving dialogue and compromise to end the impasse. It also explains his attitude towards the US and its heavy-handed behavior with Pakistan. His call for self-sufficiency resonated in a country tired of repeated humiliation. His stance on Kashmir is different for he chooses to focus not on the territorial issue but on human rights and better conditions for the population. Such pragmatism should find a sympathetic ear in Delhi and lead to better relations in the near term, with always the hope for a final solution based on some form of autonomy. His frequent mention of increased trade if implemented would form economic links and a meshing of interests to the benefit of the subcontinent as a whole — confidence building measures essential to trust and long-term peace. Much of all this can become inconsequential very quickly if the Hindu nationalist movement takes greater hold in India, or religious extremism in Pakistan. 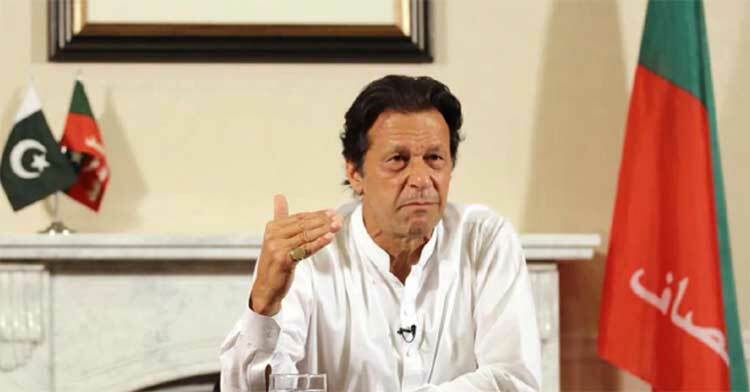 Despite Imran Khan’s rhetoric, it is difficult to imagine him permitting the latter and its dire economic consequences. What is the meaning of “radically”. A misuse of the word makes one laughingstock. Collecting runs in test matches and politics are different. Otherwise, all cricket-playing countries would have elected the best cricket players prime ministers and presidents. That would have been a poor show of state of politics and political system. A good cricket captain can be and cannot be a good politician, which depend on the state of politics in the concerned country. What has a high court judge told recently? One should think over and get concerned with that observation by the judge. What are the editorial comments over the last few days? Should not one look into those? China-support is not that what is imagined by a section of the establishment: blind, all out support. The support will not be blind, all out. Imran Khan is a right-wing demagogue who bashed feminism and spoke in favor of the “blasphemy” law during the course of his campaign. If his opposition to the “war on terror” was genuine, he would criticize the Pak army for its facilitation of the US war on Afghanistan and for allowing US drone attacks in the tribal areas which have killed scores of civilians over the years. I turn astonished with Dr. Arshad M Khan, a former Professor based in the U.S. whose comments over several decades have appeared in a wide-ranging array of print and internet media and whose work has been quoted in the U.S. Congress and published in the Congressional Record, using the word “radically” if your, Mr. Ali Mohsin’s, claims are correct. Are you, Mr. Mohsin, referring to false information? Or, is Dr. Khan making wrong analysis? Is it possible for such a learned scholar to make wrong analysis? You, Mr. Mohsin, claim that “Imran Khan is a right-wing demagogue who bashed feminism”. But, Professor Khan is presenting another analysis, and writing: “the exaggerated fears of certain commentators whose bread and butter is feminism.” So, is not it logical to substantiate your, Mr. Mohsin’s, claims as a scholar like Professor Khan can not make wrong analysis? I think Dr. Khan and I just have “radically” different worldviews. The article lacks any sort of class-based analysis. He doesn’t mention how Imran Khan ‘s victory was made possible due to support from the military and the entry of corrupt ‘electables’ from other parties into the PTI. As far as feminism is concerned, I think opposing feminism is deeply reactionary and irresponsible, especially in a country like Pakistan, one of the worst countries in the world for women. He clearly made his anti-feminist comments in order to win support among the more backward layers of the population. Dr Khan also seems to take issue with people whose “bread and butter is feminism,” as if women’s issues aren’t fundamentally important. I have attached some links on Khan’s comments on feminism and reactions to it from various writers. People can judge for themselves. Thanks, Mr. Ali Mohsin, for your reply to my reply.You have labored a lot to substantiate your position. This is praise-worthy. I’m astonished with your labor. But, I fail to understand Professor Dr. Arshad M Khan’s position as you have depicted. Because, he writes in Countercurrents, and many other progressive on-lines. Is it possible for him to take, as you wrote, yours and his “‘radically’ different worldviews”, having no “sort of class-based analysis”, not telling the way of “Imran Khan ‘s victory” — “support from the military and the entry of corrupt ‘electables’ from other parties into the PTI”? Shall Professor Khan miss these? Or, are there problems with your, Mr. Ali Mohsin, information? To you, as you assert, “opposing feminism is deeply reactionary and irresponsible, especially in a country like Pakistan, one of the worst countries in the world for women.” Is it possible for a scholar like Professor Khan to take such a position as he is writing in Countercurrents and other progressive on-lines? You, Mr. Ali Mohsin, wrote: “He [do you mean Mr. Imran Khan?] clearly made his anti-feminist comments in order to win support among the more backward layers of the population”? Then, I am confused with Dr. Khan’s article. You, Mr. Mohsin, wrote: “Dr Khan also seems to take issue with people whose ‘bread and butter is feminism,’ as if women’s issues aren’t fundamentally important.” Then, what is Dr. Khan’s position? I am confused. Because, he regularly criticizes Trump and reactionary forces in India. He gets space in progressive on-lines. I understand that progressive on-lines don’t give space to anti-women writers. I am failing to understand the whole thing. I have accessed the links you have attached. The articles talk differently. I am thankful to you for the links. Then, my confusion grows: How can progressive on-lines miss these articles and give space to something else? I think Professor Dr. Arshad M Khan have some information and arguments, which I am failing to understand, and which will help readers like me to understand the issue. Mr. Ali Mohsin, thanks again for your help with information. I hope, you will present an article with more information and reference to help understand the issue.